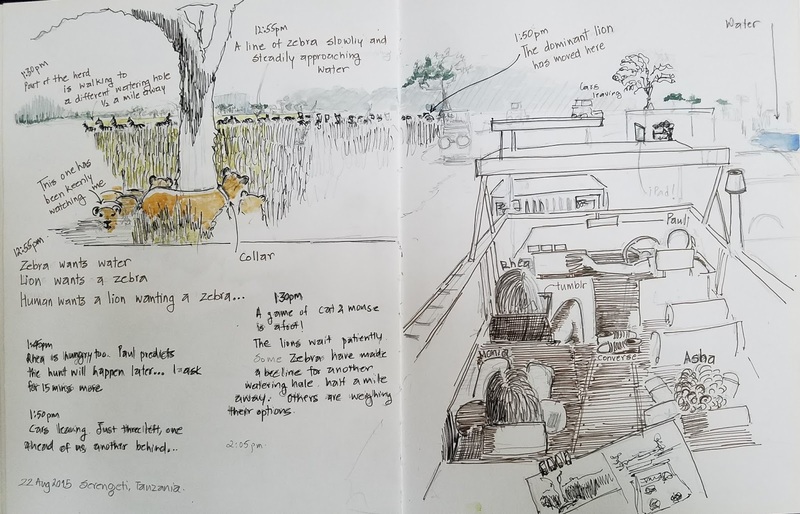 Urban Sketchers Seattle: What is my style? 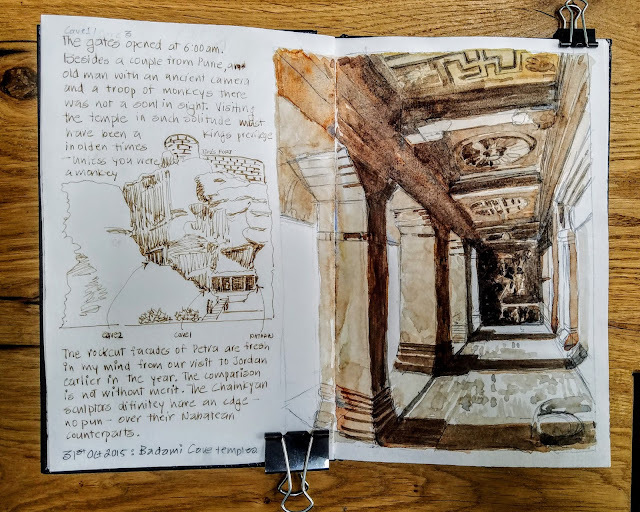 Recently while going through my travel sketchbooks of the last three years, I realize that every one of my sketches is a sum of every other sketch I have seen. Here is a little trip down sketchbook lane. Also if the teacups and pastries on every other page do not give me away already, I am clearly influenced by Liz Steele’s style. 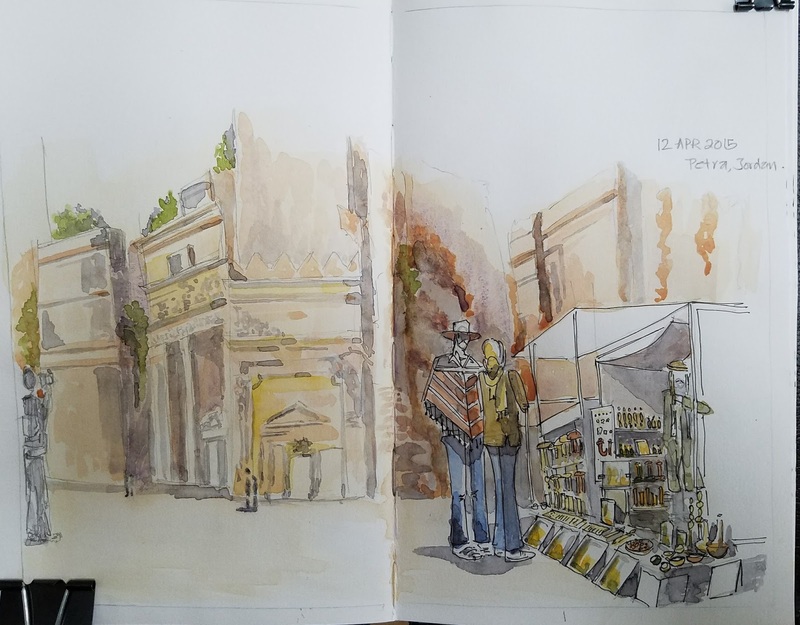 Apr 2015 Jerusalem. We have been allowed to the Temple Mount on our third attempt in as many days. Rhea (age 13, then) has just been reprimanded at the entrance by a burly security guard for leaving her petite forearms uncovered. 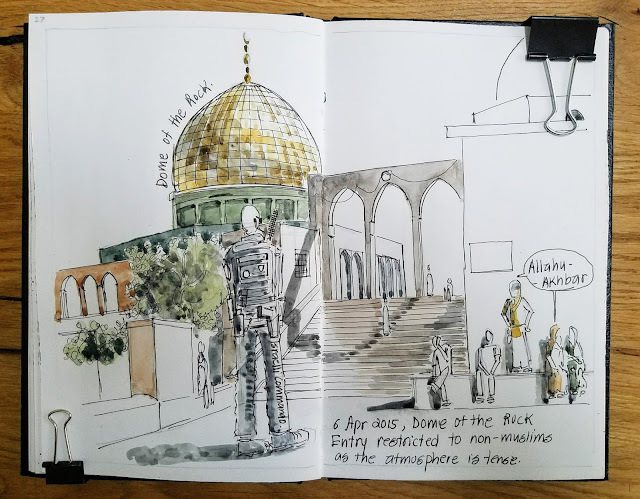 I find a cool spot in the portico of the Gate of Chains and have been sketching for a few minutes when a group of pilgrims in religious frenzy start shouting slogans in Arabic and advance towards the Dome of the Rock. Elite Israeli commandoes, armed to the teeth and silent as the shadows take strategic positions. The atmosphere is high-strung. Even the unshakeable Rhea is shaken. 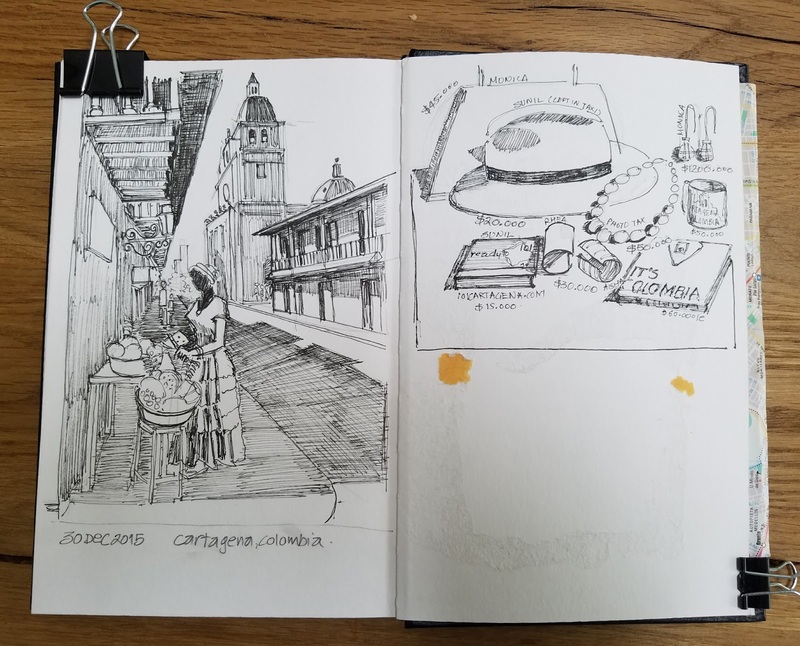 By now I have evolved from sketching objects to capturing the story - at least a good part of the story, I think. 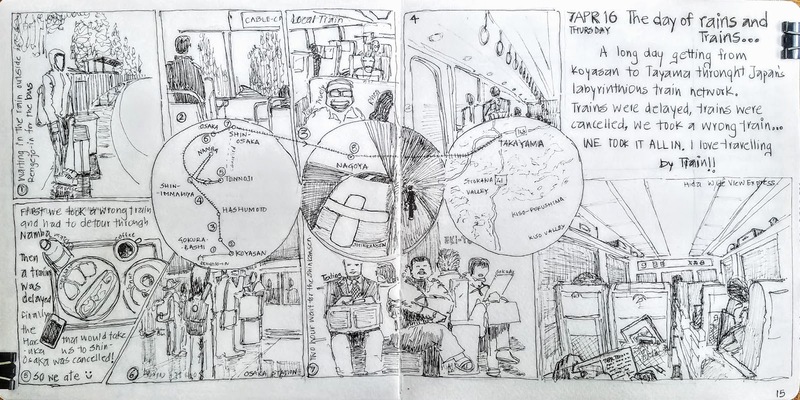 I have started including outlines of human figures in my compositions after realizing that travel sketches without people make sad-looking travel sketches. April 2015 Petra, Jordan. I have been studying David Roberts for weeks in anticipation of painting in locations he painted almost two hundred years ago. I am shamelessly copying the style of the 19th-century artist and traveler - a lightly washed background, local people in colorful garb in the foreground. 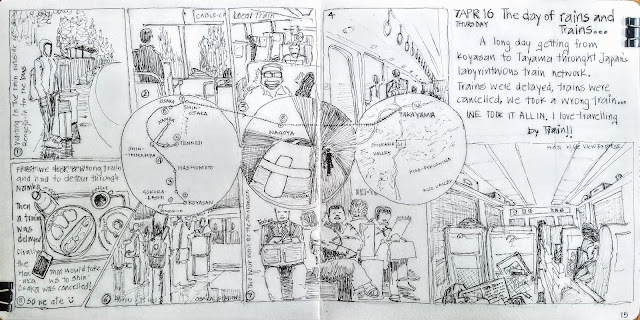 I must admit this is one of my favorite travel sketches ever. It manages to capture the passage of time on that lovely sultry afternoon on the Serengeti plains like a time-lapse photograph. 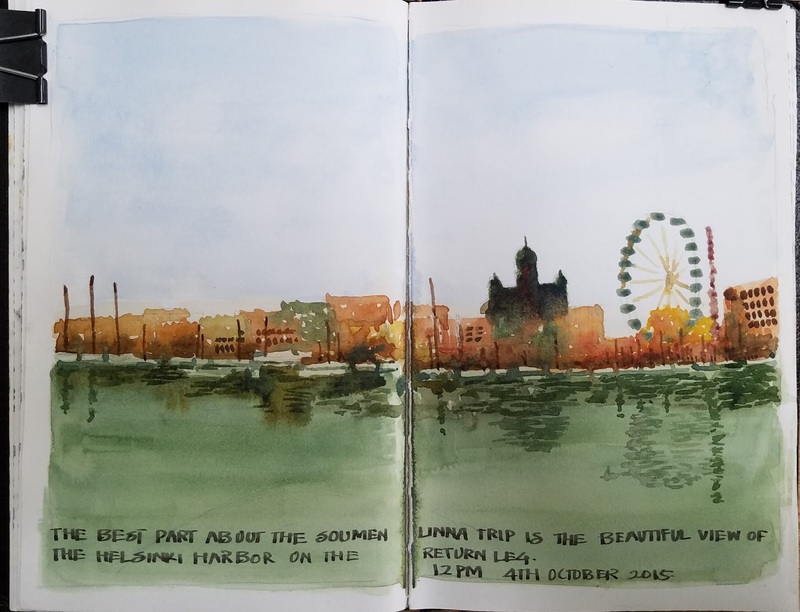 October 2015, Helsinki Harbor. I paint this scene sitting on the deck a ferry on a crisp bright afternoon. When it comes to style, it is diametrically opposite to the minimalist style I had adopted in Tanzania. I have recently attended a Michael Reardon workshop and am still under the spell of his hauntingly beautiful brushwork, wet paint melding into wet paint creating attractive results. Oct 2015 and I am in cave temples of Badami in Southern India. I have been enamored by the sketches made by Frederick Catherwood in the Yucatan in 1840s. I have been longing to sketch like him - sepia tones, intricate details side by side loose studies. I am leaving my watercolors in the hotel room by the time I am in Cartagena, Colombia in Dec 2015. Not having to paint leaves me with two times as much time with my lines. I am finally able to add recognizable human figures to the two point perspective that Stephanie Bower patiently taught me. 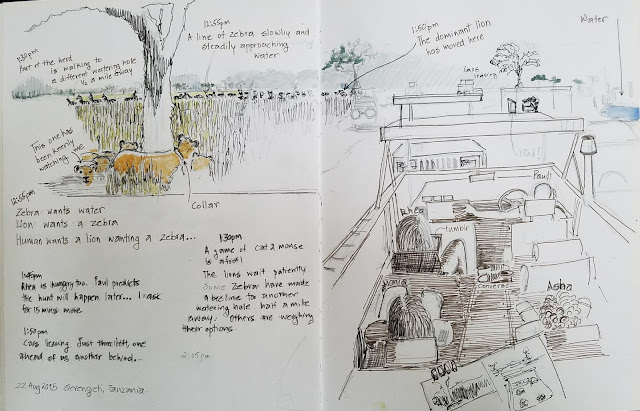 On a cool spring day in Apr 2016, Rhea and I switched twelve trains to get from Mt. Koya to Mt. Takayama in Japan. A comic-style illustration page of that saga was a wonderful exercise in composition. My Japan sketchbook is mostly black and white - Unipin Fineliner pen and paper. I continued with the monochrome experiment until I could not figure out a way to describe the vivid warmth of the yellow saffron robes of the monks in Chiang Mai in July 2016. So I dabbed a little paint back in the hotel on the composition that is rendered in James Richards’ unmistakable style. Now here I am sitting on four-hundred-year-old steps near the iconic Charminar in Hyderabad in Nov 2016. I have ditched my watercolor pans all together in favor of Dervent watercolor pencils. The pencils are easy to carry and easy to use. I like this setup. This is my style, I decide. Fantastic! Thanks for sharing your evolution. Love this. It affirms my own eclectic styles. Always want to try something new.